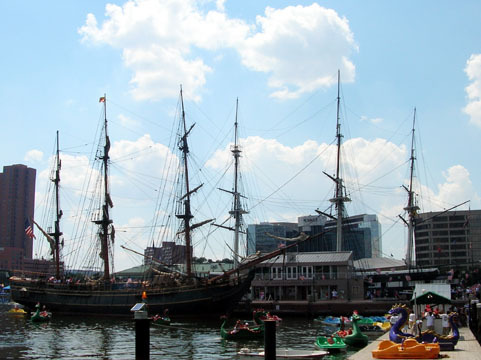 The HMS Bounty was in Baltimore for the weekend. This is a Canadian-built replica of Captain Bligh's vessel, built in 1960 for the Marlon Brando Mutiny on the Bounty and acquired by Ted Turner when he bought the MGM film library; he has since donated it to a tall ship organization that uses it for sail training and cruises. 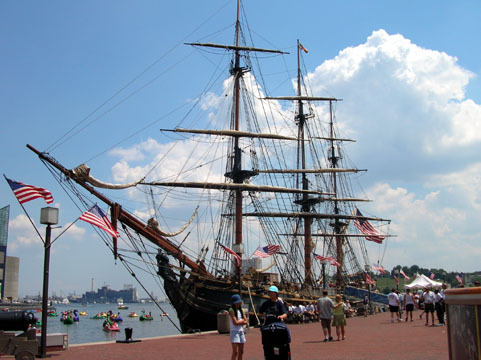 Here is the ship docked on the far side of the USS Constellation's pier at the Inner Harbor, Baltimore. 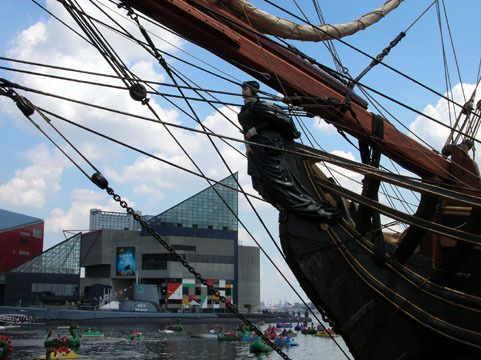 Here is the Bounty's masthead with the National Aquarium visible in the background. Built in Nova Scotia, she was sent to Tahiti to film Mutiny on the Bounty for a year, then went to numerous ports in the US and across the Atlantic to London to publicize the movie. The whole of the World Trade Center looking down on the Bounty and the Constellation. 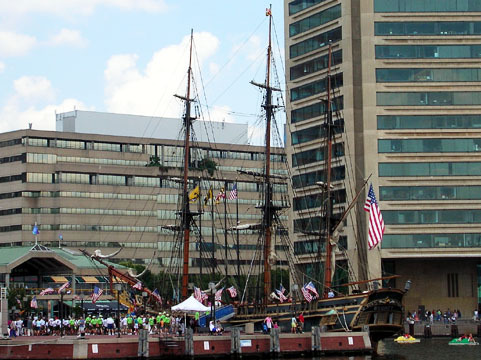 Baltimore was very festive this July weekend, still celebrating Palmiero's 3000th hit, with outdoor Andean music and hip-hop at points around the harbor and lots of cruise ships preparing to sail in the evening. 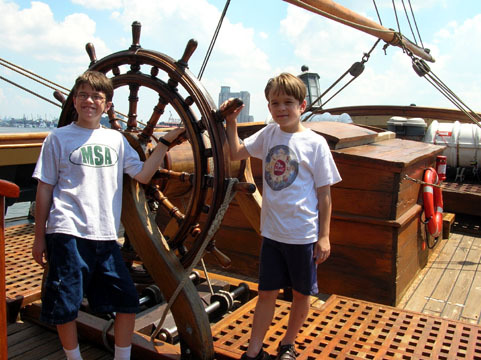 The Bounty's tours teach history as well as sailing. 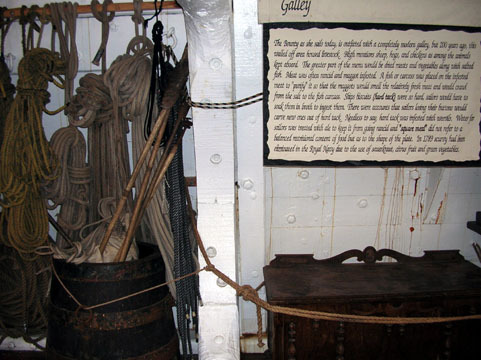 Signs like this one explain the function of the mess (and why elbows on the table was considered bad manners on land), arms chest (whose stolen keys led to the mutiny), great cabin (which on the original Bounty was apparently used as a greenhouse to transport breadfruit plants), etc. 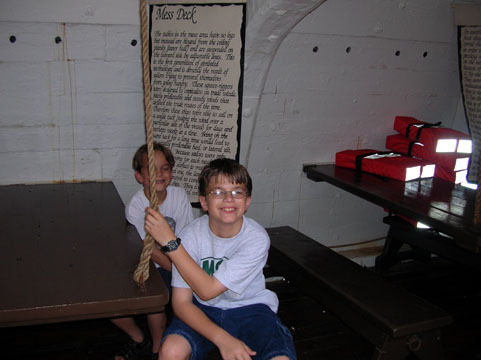 Here are Daniel and Adam resting at a table in the mess. 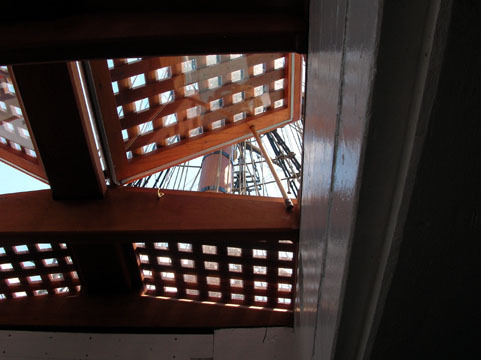 Looking up at one of the masts from below decks. 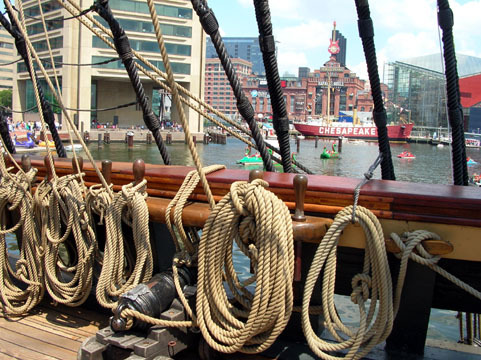 Looking toward the front of the ship, docked with her prow toward Harborplace. Bounty's wheel, an object likely touched by Marlon Brando. 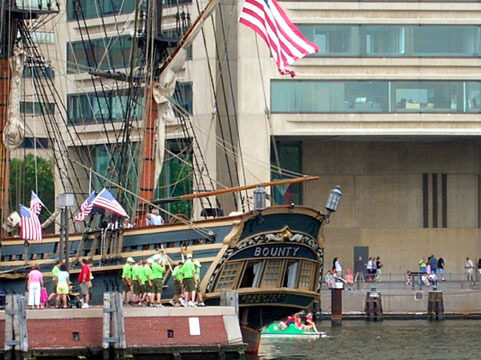 But more importantly to my kids, the Bounty also appeared as the pirate ship in the Spongebob Squarepants movie! The USS Chesapeake and the Power Plant from the Bounty. 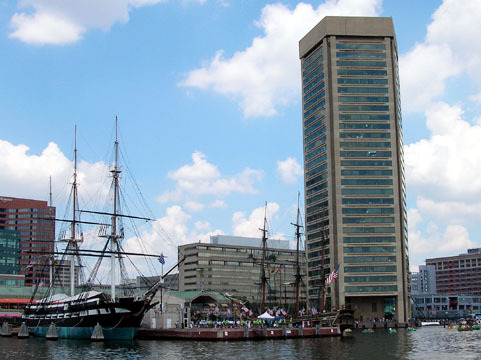 Many of the best views of the harbor are from the decks of ships like this one and the Constellation, though really I think the best view is probably from the tall ships Pride of Baltimore and Clipper City as they cruise in and out. 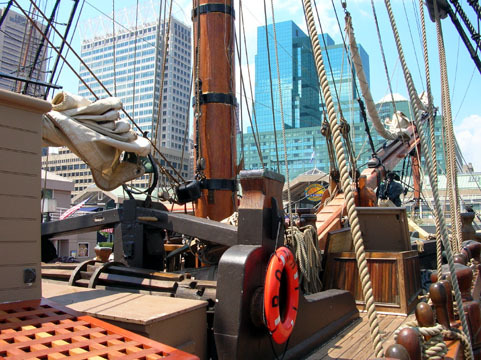 The Bounty and the Constellation from the World Trade Center deck.